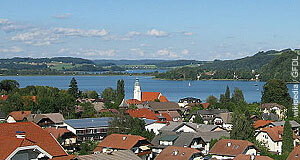 Seeham is a village in the Flachgau with a population of approximately 1,800. It is situated on the Western shore of the Obertrumer See, one of the lakes in the Salzburger Seenland (Salzburg Lake District). The Obertrumer See is one of the three Trumer Seen lakes, which were once one large lake. Today, they are still connected via canals. The area around the Trumer Lakes has been populated since Neolithic times; then by Illyrian tribes, Romans and finally Bavarians. Under the rule of the latter, the area of modern Seeham became property of the monastery in nearby Mattsee and as such of the Bishop of Passau. Only in 1398, the Archbishop of Salzburg gained the area. For centuries, Seeham remained a sleepy village. Only in the late 19th century, it suddenly became a fashionable summer resort. Wealthy aristocrats from Vienna and Munich spent their vacations here and as soon as 1927, a park was bought by a newly formed tourism board. This was an age of great optimism: The Salzburg Festival was founded and tourism brought new sources of income to Seeham and other towns in the Salzburg Lake District. Seeham built a promenade and developed enough of a tourism infrastructure to maintain it until today. This is unusual: The northern Flachgau had its tourism heyday before WWII; after the war, is moved to the city of Salzburg, the Salzkammergut and anywhere where people could ski. However, Seeham still manages to sell some 37,000 overnight arrangements a year, almost all of them during the summer season. Today, the public lido is still the core of the tourism facilities in Seeham. A few years ago, it was supplemented by a floating stage. Annual events cleverly pull the "Sommerfrische" (old-fashioned term for summer holidays) note. Visitors of Seeham are usually Austrian or German nationals; nevertheless, even non-German native speakers could enjoy a visit there, for the sake of hiking or water sports off the busy lakes in the Salzkammergut and still close to Salzburg.